Mary Quinn leads a remarkable life. At twelve, an orphan and convicted thief, she was miraculously rescued from the gallows. 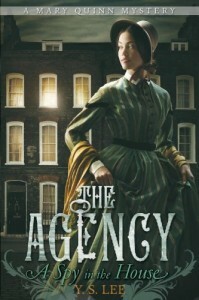 Now, at seventeen, she has a new and astonishing chance to work undercover for the Agency. It is May 1858, and a foul-smelling heat wave paralyzed London. Mary enters a rich merchant’s household to solve the mystery of his lost cargo ships. But as she soon learns, the house is full of deceptions, and people are not what they seem—including Mary herself. As a convicted thief, twelve-year-old Mary Lang is about to be executed when she is saved by the ladies of Miss Scrimshaw’s Academy for Girls. There, she receives an education and by the age of seventeen is teaching other students the skills they will need to be independent. Trouble is, she’s not satisfied and the few other career options open to her gender don’t interest her much, either. When she mentions this to the two women running the school, they suggest another alternative: the Agency. The Agency is a covert organization of female spies, operating under the assumption that because women are presumed to be flighty and empty-headed, their agents will be able to retrieve information more easily than a man might, particularly in situations of domestic servitude. Mary quickly agrees, despite the threat of danger, and soon finds herself serving as paid companion to spoiled Miss Angelica Thorold, whose merchant father is suspected of dealing in stolen Hindu goods. Mary (now using the surname Quinn) isn’t the lead on the investigation and isn’t supposed to actually do much of anything, but she gets antsy, and in the process of snooping meets James Easton. James’ older brother desperately wants to marry Angelica, but James has heard rumors about her father’s business practices, and so is doing some sleuthing of his own to determine whether a family connection would be unwise. He and Mary form a partnership and spend most of the book poking about in warehouses and rest homes for aging Asian sailors and following people on foot or in carriages while maintaining a flirty sort of bickering banter. Not that it isn’t nifty to have a part-Asian heroine, of course. Mary is competent and level-headed, though I admit I did get irritated by how often she is favorably compared to “ordinary women,” who would scream or faint in situations in which Mary is able to keep her head. When a mystery stars a male sleuth, do we need to hear over and over how much smarter he is than the ordinary fellow? I don’t think so. On the flip side, the overall theme of the book seems to be “don’t understimate women,” and Mary finds time to inspire a scullery maid to seek out Miss Scrimshaw’s and to convince Angelica to pursue a musical career. In the end, A Spy in the House is a decent read. It’s not perfect, but I still plan to read the second book in the trilogy in the near future. Regarding the part-Asian thing, I have to admit I was terribly confused by the fact that she kept using the term ‘lascar’ to refer to her father, because I had always understood that to mean Indian heritage, not Chinese. This article seems to agree with me, so I remain rather puzzled. I’m assuming Lee did plenty of research on the subject (because frankly, whether her father was Chinese or Indian specifically has thus far had little import and would have required only very minor tweaking to change it one way or another) in order to come to her choice of Chinese. Before it was revealed she was half Chinese, I believe I had thought she was part Indian. And I still maintain we should’ve known this up front, if Mary herself knew. Which she did. This article on Wikipedia both supports and dis-supports the use of ‘lascar’ to refer to Chinese men. In one case, it says ‘Lascar, Chinese, and Japanese’ but then in another spot it says ‘Chinese sailors were employed as lascars’. So is it both a term of racial/ethnic identity _and_ a profession? Two different terms? Or what exactly? As for male sleuths being claimed to be smarter than the average man, I don’t have too much experience, but it seems true to me. Sherlock Holmes (and House). Everyone goes on about how brilliant they are. Monk too, in a different sort of way. And, um, other examples I can’t think of. I assumed part-Asian from the first because of the surname ‘Lang.’ I’d never actually heard of lascars before, so the term didn’t confuse me. Captain Hastings serves the same purpose for Poirot. They’re there to serve both as foils and to be astounded by how intelligent their detective companion is. My main familiarity with the term lascars came from um… A Little Princess maybe? One of those turn of the century books is where it turns up. That’s true about Hastings… so maybe it’s less of a female protagonist problem than I’d been thinking. Lang didn’t strike me as Asian. Possibly a subconscious influence from Lana Lang.